Fabric---100% cotton. Comfortable, soft, non-irritant, and fit the baby skin. Give the customer the best experience to wear. 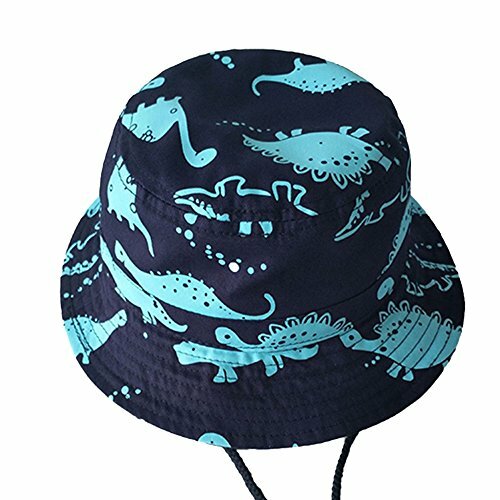 Feature---Cute sun hat for baby kids. Occasion---Perfect to wear for walks in the park, playing in the sand at the beach, or simply as a casual everyday wear accessory. Hat circumference: About 54cm(21.3 inch), recommend age:4-8 years old. 2. There is 1-3cm difference according to manual measurement. 3. Easy Care, Hand Wash, Line dry, Do not bleach. 4. Folding packing, When you receive the hats, it might have some creases. It will recover for a short period of time. Size Guide: Hat circumference: About 48cm(18.9 inch), recommend age:6-12 months; Hat circumference: About 50cm(19.7 inch), recommend age:1-2 years old; Hat circumference: About 52cm(20.5 inch), recommend age:2-4 years old; Hat circumference: About 54cm(21.3 inch), recommend age:4-8 years old. This lovely functional baby kids hat fits for most occasions. Perfect caps for the backyard, home, picnic, Camp, Hike, Photo Shoot or Casual. Great presents for a birthday or other significant event. If you have any questions about this product by FULLANT, contact us by completing and submitting the form below. If you are looking for a specif part number, please include it with your message.